Project Servator has been introduced at Birmingham Airport in a bid to tackle criminal behaviour. Picture by West Midlands Police. WEST MIDLANDS Police have adopted new specialist tactics at Birmingham Airport aimed at tackling terrorism and other criminal activity. The tactics – named Project Servator – have already been adopted at transport hubs at sites across the country including London, Essex and North Yorkshire. The force said the project is designed to deter, detect and disrupt a range of crime, while reassuring the public. There will be a number of police sniffer dogs on duty around the airport as well as officers talking to people. The police forces added there would be back-up readily available to arrive at the airport at any time and at any location in and around the airport. Uniformed and plain clothed police officers are trained to identify anyone wanting to commit crime and are supported by specialist police resources such as search dogs and armed officers. CCTV, vehicle checkpoints and covert armed officers will also be used to keep people safe and secure. Airport Commander Inspector Chris Cotton said: “One of the key elements of Project Servator is unpredictability, so don’t be surprised if you see a visible police presence pop up at various times and locations across the whole airport using different resources. “The safety of everyone visiting and working at the airport is our priority and these new tactics will continue to help us further combat crime we see at the airport. 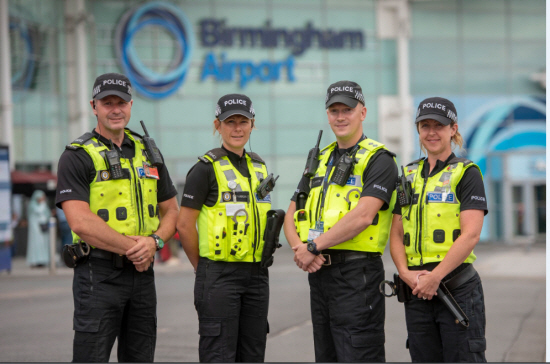 Bob Graham, operations director at Birmingham Airport, said: “Project Servator is an integral part of the on-site policing function that we have here at Birmingham Airport. Anyone who sees anything suspicious can report it directly to an officer, emailing airport_police@west-midlands.police.uk or calling 999 in an emergency.